The Kirk maneuver, in full effect. 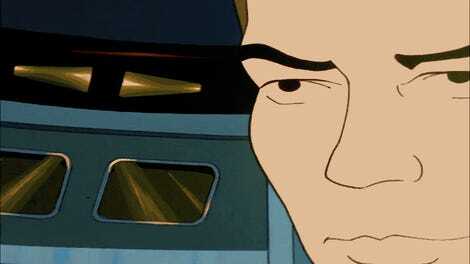 Today is James Tiberius Kirk’s birthday (or will be, in 214 years and also in a fictional capacity). In celebration of Star Trek’s iconic captain, let’s took a look back at what became his most infamous mission...and how really, it’s a mission that’s about so much more than a double-fisted smack to a Gorn’s spine. But “Arena” is probably still my favorite example of Peak Kirk, because rather than specifically highlighting his more noble aspects as other episodes do—his drama, his wit, his charm—it’s an episode that gives us all those layers at once, while acknowledging his rough-and-ready attitude that Trek Captains since have longed to emulate (if they didn’t see themselves as so far beyond that roguish, scrappy nature in their advanced eras). Kirk as a character, and as a figure in pop culture identity, is often whittled down to just one of those attributes in our memories, but he contains multitudes, and “Arena” strikes the balance between some of them while also serving up a tense and thrilling bit of action in the process. The Enterprise landing party finds the Cestus III outpost in ruins. In the context of the modern age, the infamous fight sequences in “Arena” are certainly not John Wick, but have a distinct charm to them, a primal and clumsily raw feeling that still sort of works with a bit of suspended disbelief. While the episode is most remembered for the fight between Kirk and the Gorn, the set up of the episode features the Enterprise en route to Cestus III to visit a new Federation outpost, only to arrive on the world and find the outpost in ruins and the inhabitants wiped out. There, Kirk and the crew are confronted by an overwhelming alien force (that’d be the Gorn) they immediately give chase to...leading to a third party, the Metrons, intervening and deciding to solve the Federation and Gorn’s conflict by teleporting Kirk and the Gorn Captain down to an uninhabited planet and forcing them into a battle to the death so they can duke it mano-a...lizardmano? 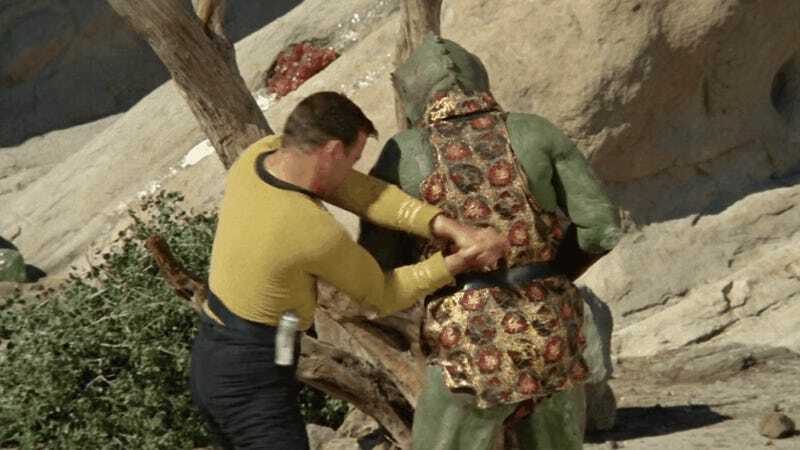 One protracted yet highly-memetic set of fisticuffs later, Kirk combines his machismo and his ingenuity to craft a makeshift cannon to defeat the Gorn...only to refuse to give the killing blow, proclaiming that humanity has grown beyond the mere predatorial display Kirk had just spent the rest of the episode embodying. Touched by his evolved sensibilities, the Metrons spare both Captains from death (after revealing to Kirk that the twist was they’d have killed him if he’d actually killed the Gorn, for giving into his primal instinct), and the Enterprise goes on its way in the hopes that peace talks can resolve the initially hostile contact with the Gorn. Kirk wrestles with his moral code and primal urges. What makes “Arena” Peak Kirk—in a way that his perhaps more nobler displays in the likes of “City” and “Balance” don’t—is, for better or worse, it embraces his duality as a swashbuckling space hero and someone who champions a utopian society that has moved beyond such sensibilities. It admits that, as strongly as Kirk holds to those idealistic beliefs, when his back is truly against the wall, he’s willing to fight to the scrappiest tooth and nail for them as well. “Arena” is honest about it in such a way that, when he is ultimately standing over the wounded Gorn and ready to execute the being with its own blade, you almost think Kirk will actually go through with it. That he doesn’t speaks to the truest strengths of his moral core. But crucially, the thesis of “Arena” beyond that is that Kirk ultimately accepts both sides of himself exist, and that he and humanity have a ways to go before that could change—“We’re a most promising species,” he slyly reflects with Spock at the episode’s end, “as far as predators go.” The promise to be better is an ongoing process that Kirk and his fellow humans are still engaged in, even having come so far. It’s a rare acknowledgment of a flaw in a tiny little facet of Trek’s mostly perfect society. Not all of “Arena” works as well as this. Its biggest conceit requires viewers to casually ignore that the Gorn Captain was quite fine with being a mass murderer before its battle with Kirk, even with the justification that the Federation’s outpost was encroaching on their territory. It also doesn’t really begin to interrogate the expansionist undercurrent hidden within that subtext, of the Federation going around—apparently rather lackadaisically—just violating other sentient races’ territory in the name of its establishing its own. It’s a schlocky, action-packed sci-fi B-movie, and doesn’t quite stand up to some of the higher ideals it wants to allude to. Kirk contemplates humanity’s betterment at the episode’s denouement. But as a spotlight on the dualities of Kirk—the braggadocious action hero and the elevated, advanced moral touchstone—an encapsulation of the two halves that make him a much more interesting whole than we often remember him to be? I can think of no better one-two-punch. Or, at least, no better double fist.